For Krita 2.9, tested on Linux. Note: I don't own Windows or MacOsx system. 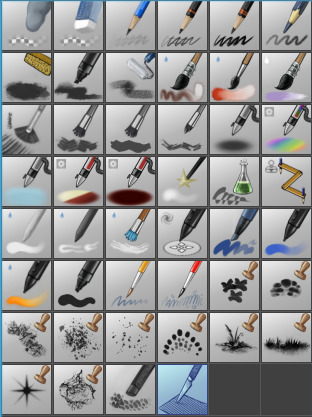 Brushes removed from previous V6 version can be found on the Bundle folder. To install, download deevad.bundle file ( in a zip, extract it after download ) , then import it in Krita this way : Setting > Manage Ressources > Import Bundle/Resources. mentioned at the end of the article, 2 september 2015 . Thanks David, as always, for your valuable time and resources. Great assortment of brushes. You rock man! I really like them and will keep on testing, both on my desktop and my tablet. Great job. Thank you very much! Been using your V6 brushes for a while & they are excellent. Thank you. Looking forward to trying these now - have a windows setup so hopefully work ok! @Godfrey Clayton : Yes, the bundle works on last Krita version. I had positive feedbacks about it. pd, love the new stamps! @Felipe Ramirez : :D Thank you for positive install feedback. ...the blending has definitely improved. My current favourites are the dynamic blender and the paint sketch brush. @Digidirt : Thank you for your test and for noticing ! For a better blending, I use a sub-pass of opacity pressure managed with the 'texture' engine. But instead of a texture, I feed the system with a RGB128,128,128 grey 'flathack.png' texture. :D something I found by accident. Happy accident. @Eggsy : Hey :) Thank you. Check also the folder 'bundle' maybe the previous V6 is in this pack as bundle. Le pack de brush ne fonctionne, j'importe le bundle mais après rien, est-ce que celà fonctionne avec windo 7 ? Merci bonne continuation. @Girou_ : Merci de mettre à jour votre version de Krita, réessayer, et si ça ne fonctionne pas, de rapporter ça aux developpeurs. Je ne peux pas tester sous tout type de Windows , je n'ai pas ce système à la maison depuis 2009. Hi : ) this brushkit looks amazing. I've used the V6 before and that was awesome too so thank you very much for making these great resources. I wanted to download this as a bundle but somehow when I click the Bundle link, I end up on a page with only text and signs. I don't know if it's just me, so I thought that it might be good to notify you of it. @Shana : Hi Shana, the links were working, but I made a change to the page for being easier to download bundles. If you still have only numbers after clicking this links, it means your webbrowser tries to open the bundles and read the content as a webpage. To avoid this behavior, you can probably right-click on the links, then select an option as ' Save the target of the link' , 'Save Link As' ...etc. Last alternative link in case every other things fails ; go to my deviantart page http://deevad.deviantart.com/art/Deevad-krita-brushpresets-7-557823501 , and press the download button on the right column. The bundles are inside a ZIP on deviantArt. Love your brushes, fun to play with, and useful in general. Only things I haven't used at least once were the brushes. Thx - very nice brushes indeed. Works nice in Windows 10. I am a disabled veteran who was forced to retire from actively working after 40 years in Information Technology. It is impossible to simply shut your mind down when you have done nothing but sometimes extremely deep concentration for 40 years and I am trying to use art to save my sanity. I was actually pretty good before age crept up on me and almost stole my hands and arms. Carpal tunnel is not fun when you get old. :-) Your brush set, recommended by a wonderful person named vasco is going to be a huge help to let me begin making my own mistakes and doing art for myself, without fear. I simply cannot thank you, or Vasco for his amazingly helpful encouragement. I know this is probably not politically correct but I really don't care unless it offends. God Bless both of you! @Richard Morgan : Hey Richard, Thank you for the warm comment. If the brushes are bit too hard ( requiring a bit too much hand pressure to get effect, and I often setup them like this to be more in control with the pressure ) they can hurt. Making too much activity in muscle hand. I mde another article about pressure sensitivy and calibrating it. You'll probably be interested in this one too. Have fun with sketching! Thank you so much for so much beautiful work to look at and fuel my own dreams and brushes to help the whole thing have a much greater chance of happening. I have stated before that meeting the artists using Krita and so selflessly sharing their knowledge and materials has actually given me back some faith in humanity. It's been a rough 5 years for this old man, mostly physically but your soul takes a hit when you have been ill for such a long period. However, I see a silver lining ahead and plan to go into it with no fear. I am testing your brushes in a Win8.1x64bits, and they are working just great! I would like to thank your work and donation to all of us hunger of Art. (by the way David, is it simple for me to do the "blender brush" that you mentioned directly to @Digidirt ? @Carlos Ferreira : Oh cool ! Thank you for the feedback. I'm about to release in the next weeks a new version of the brush kit with another layer of improvement ( I experimented during the last 5 episodes of Pepper&Carrot ) for all my blending/painterly brushes. I forgot to ask on my previous post, what about if I want to delete all pre-loaded brushes but one, and save it to be used when I open Krita again?... Would you mind to send me a proper link (I did see several youtube videos related to this subject but they were not helpful at the end) to learn how to do that? So nice and wonderful tutorials it's also very helpful for us . David I cant "put" the brushes in krita. I've downloaded the zip file but when I go to Import bundle/resource the folder is empty and when I go to open resource folder the brushes are there but they dont go to krita. It’s just like a dream came true. In your post these art are very nice. I like so much. Thanks a lot to share. @Simone : Hi Simone, please be more specific and tell me what you have tried, and on what type of computer, system, and krita version. ubuntu linux on acer aspire, deevad-krita-brushpresets-7.0. Importing brushes and selecting this files, MyPain tells me that there is a programming error. @dash : Thanks for the feedback, I updated the 'how-to' at the end of my article to be easier with the file name. Awesome! I think It's a absolutely useful brush kit. Thank you for your hard work, David Revoy. Thanks for the brushes and keep up the good work! @Nurul Subhan :Hey Thanks! For improving slow/lag of brush, check this menu in the FAQ: https://docs.krita.org/KritaFAQ#Slow_Brushes ; good luck ! 2.9.11 on windows 7 seems like it's working. thanks! @dcofjapan : Thank you for the feedback ! @Morten Telling : And a big big thank you for your support Morten! I loved your V6 brushes ever since I downloaded them. Can't wait to try out the new ones! Try again to download the 'bundle' and import it in Krita Setting > Manage ressources ; good luck ! Oh my god. I love your brushes so much ! Its like..magic...Thank you for sharing your brushes! Mr David your brushes and tutorials are excelents but the format .bundle are not working make click and not download. The download send me to a code but nothing more. are you know that's happening? Thank you fore your brushes they are working just great! Thanks.